My awesome and hilarious co-worker at the comic shop pointed out to me last week during our shift together that he wondered if there were any books I actually enjoyed reading. When I was confused as to why he was asking this, he explained that he found the majority of my reviews to be amusing, because they were mostly “angry rants.” Okay—fair enough. I guess I can see why he’d say that. In fact, what few positive reviews I give seem to get lost in between the criticisms. Sometimes it’s so much easier to write about things you dislike than the things you love—the bad stuff gives you more material. But, yes, there are actually a number of books I’m really enjoying right now—Mike Carey’s X-Men Legacy tops the list, hands down. Gail Simone’s Birds of Prey has been everything I wanted the book to be since it came back. Bryan Q. Miller’s Batgirl has been a gem that, sadly, a lot of people seem to be missing. I am always counting down for whenever the next Fables or Walking Dead trade is due on the shelves. And now, Secret Avengers is the only Avengers book I’m actively picking up. Steve Rogers takes on the power of Nova in Secret Avengers #4. This choice is an odd one for me, because the first four issues of this book have taken a “space adventure” turn—something in which I’m not typically interested. But I decided to give it a chance, because a.) it’s not written by Brian Michael Bendis, and b.) it has a unique cast of characters. You have Steve Rogers, back from the dead, and taking on a managerial role on a very different scale. You have Sharon Carter, who Brubaker has developed into an influential chess piece. War Machine and Moon Knight—the spotlight on these guys can only get better as we move forward. Valkyrie is a fascinating character who adds a great other-worldly element to the group. Black Widow fits well on a black ops team, and seeing Beast as an Avenger again and working with Cap has been great. Not to mention the new Ant-Man—a slate I can only imagine Brubaker will have a ton of fun filling. This group has very much kept me involved in this title, and after four issues, I’m confident it will only continue to get better. Brubaker utilizes the fourth issue to wrap up the team’s time on Mars while finally introducing us to the villain behind the scenes—yes, there’s someone other than Nick Fury in charge here. 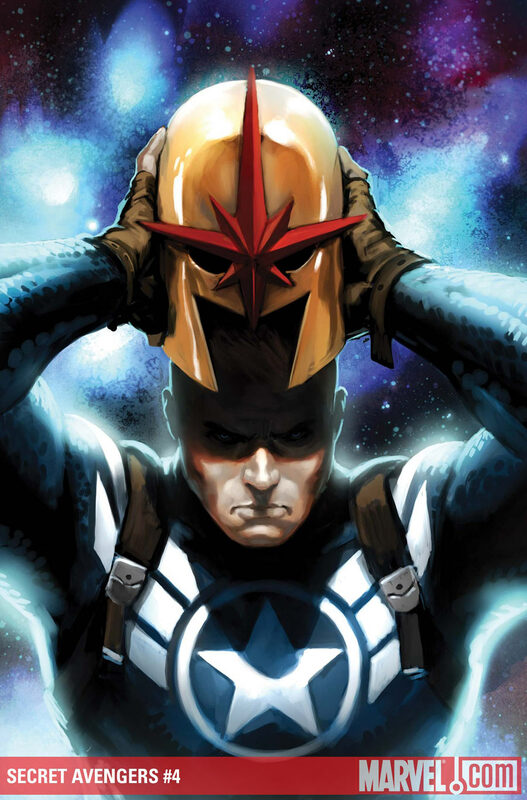 The scene following the cover, in which Steve Rogers puts on the Nova helmet, is, quite frankly, all kinds of awesome. We get somewhat of a conclusion to the crown dilemma, but Brubaker leaves just enough strings dangling to let the plot continue into future issues. He doesn’t rush the pacing—we’re developing slowly, here, and that’s a good thing. It fills me with a certain level of faith when a writer takes his time and gives me the sense he’s being meticulous. This faith is precisely why I’m not scoffing at the idea of Nick Fury being involved with the group of villains—his reveal at the end of the first issue had me raising an eyebrow, and the word “lame” may have echoed in my head for just a moment—but overall, I’m confident in what Brubaker’s building here, and Mike Deodato’s “dark,” shady art is a nice fit. I think this is going to be good, guys. And I think you should give it a try. Illustrated by Mike Deodato, Jr. This entry was posted on 09/04/2010 by ravenhaired. It was filed under Comic books, Reviews and was tagged with Avengers, Ed Brubaker, Marvel, Mike Deodato Jr..